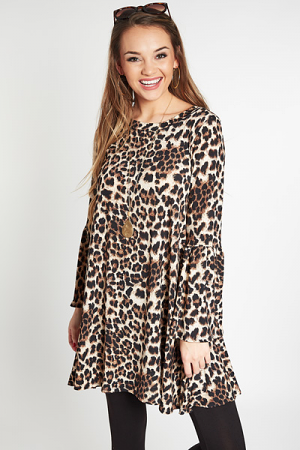 This dress offers a little twist on your typical animal print and an always favorite shift fit! Throw in some flowing bell sleeves, and you have yourself this awesome dress! Dress is fully lined, and has a keyhole button neck closure in the back. Shoulder to hem measures approximately: S- 34" M- 34.5" L- 35.5"